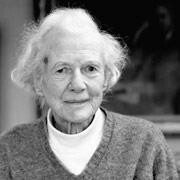 Anne Ridler’s first book, Poems was published in 1939 and she continued to write poetry until her death in 2001. She was also a librettist and wrote several plays and verse plays. She was an editor at Faber and Faber, a colleague of T. S. Eliot, a friend of C. S. Lewis and a devotee of Charles Williams. She was awarded an OBE in 2001. Some of her better known poems are I who am here dissembled for T S Eliot’s 60th birthday (“Poetry is, as you said, a mug’s game. The poem, written, is lost...”) Nothing is Lost, sometimes read at funerals (“Nothing is lost. we are too sad to know that, or too blind...”) and the late poem Snakeshead Fritillaries. Her poetry is inspired by her Anglican faith, by landscape and nature and by her family life. The Landscape was the occasion and the vessel. By their intensity exist forever.